← Black Friday Deals: FanFinds! We have a #BlackFriday special for you all…how about FREE TICKETS to Beenzino’s upcoming show in San Francisco at The Factory?? It just so happens we have an extra pair to give away! Share the giveaway post on your FB! 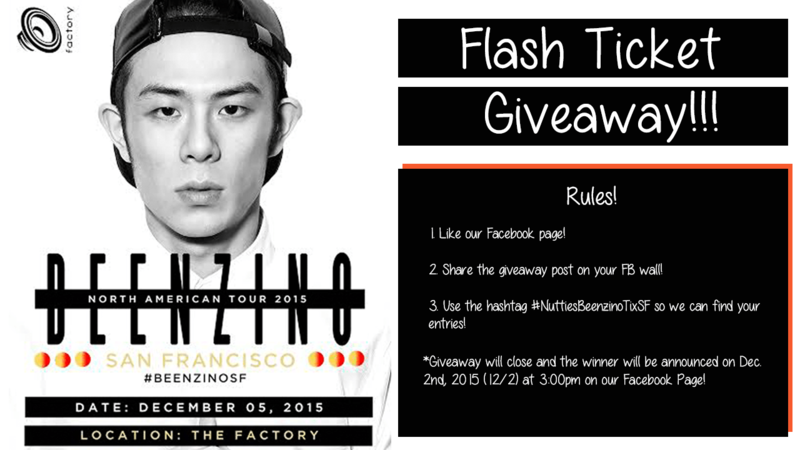 Use the hashtag #NuttiesBeenzinoTixSF so we can find your entry! The giveaway will end on December 2nd, 2015 (12/2). We will announce the winner at 3:00pm sharp! Check back to our FB page for the announcement! This is an exclusive giveaway for our Facebook fans so be sure to like our page to become eligible! Also, this will be a random giveaway since it will be such a quick turnaround! Good luck to everyone! Tickets are still available for purchase from PlatinumKShows.com! Check out the link to the Eventbrite purchasing hub here!